A Tesla Model 3 in a Los Angeles showroom in January. Tesla aims to build 5,000 Model 3 cars a week by the end of June. SAN FRANCISCO -- Tesla has all the tools to meet its planned Model 3 production rate in the first quarter. The only problem is they are still in Germany. The electric-car maker, which is still targeting about 2,500 of the cars a week by the end of March, has designed a new automated system for module production for its U.S. battery factory near Reno, Nev. The line is working at its German Grohmann unit but it needs to be shipped to the U.S. next month before it can go into use, CEO Elon Musk said. "That's got to be disassembled, brought over to the gigafactory and reassembled and then brought into operation at the gigafactory. It's not a question of whether it works or not. It's just a question of disassembly, transport and reassembly," he said on a conference call Wednesday. Once that milestone is completed, Tesla will need to fix material handling constraints at its Fremont, Calif., assembly plant before it can reach its 5,000-a-week goal by the end of June. 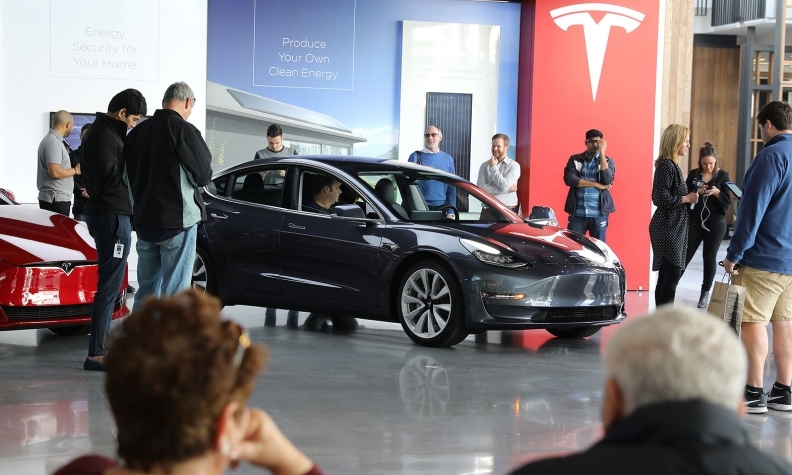 Tesla has pushed back its Model 3 production targets several times and is banking on the more affordable model to propel it from niche EV maker to mass-market manufacturer. The slower ramp means less money is coming in from customers taking delivery, and Wall Street is watching closely for any signs the targets could slip again. Jeffrey Osborne, an analyst at Cowen & Co., said the cross-ocean line relocation makes Tesla's first-quarter output goal an "extremely aggressive" target. George Galliers, an analyst at Evercore ISI, warned of "timing risk" around the reassembly process. "Should Tesla miss its 2.5k unit weekly production target, for the end of Q1, investors will be left disappointed and concerns will increase," he wrote in a note to clients. There were plenty of positive signs in the earnings, too. The company's cash balance barely budged last quarter even as it struggled to make Model 3 sedans. Paying customers are supporting Tesla through its production struggle -- they've put down more than $850 million in deposits for vehicles including the semitruck and Roadster sports car Musk showed off in November. "The business is complex, and there's almost always something for bears to focus on. But in Q4, we think most of the news was positive," Piper Jaffray analyst Alexander Potter wrote in a report. While it's going to take time to get Model 3 production to targeted levels, Musk, the CEO of Tesla and Space Exploration Technologies, has succeeded in captivating consumers in the meantime. Musk's latest promotional stunt involved firing off a sports car into the sky atop the world's most powerful rocket. The company said it is putting off spending to double its production rate to 10,000 Model 3s until it reaches the 5,000-unit milestone. It also deferred some Model 3-related capital expenditures in the fourth quarter, which "dressed up the cash flow," Cowen's Osborne said. That approach paid dividends for a closely watched figure indicating how much money Tesla is using up. Negative free cash flow was just $277 million in the fourth quarter -- the lowest in more than a year -- after two straight quarters of more than $1 billion. "All the cash concerns will be alleviated once they get these cars on the road," said Tasha Keeney, an analyst at ARK Investment Management. Tesla is still far from being in the clear regarding cash. The company finished the fourth quarter with about $3.4 billion, and it plans slightly more than $3.4 billion in capital expenditures this year after spending that much in 2017. Some of the expenditures planned for this year are linked to what's coming next to Tesla's lineup. In addition to the semitruck going into production in 2019 and the Roadster coming in 2020, Tesla plans to add a crossover called the Model Y.
Tesla will announce the location for where it will build that in three to six months, with capital spending toward the vehicle starting this year. Tesla expects to deliver about 100,000 Model S sedans and Model X crossovers, in line with last year's 101,312.